Providing you the best range of Holiday Packages Services, Luxury Rooms Services, Luxurious Cottages Package Services, Holistic Wellbeing Package Services, Green Vegetation Package Services and Large Bed Service with effective & timely delivery. Holistic wellbeing is a state where the mind, body and soul are at complete ease and harmony. And there is no better way to attain that state than in nature's care. 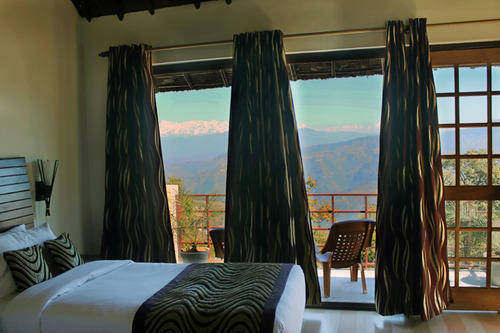 And that's what is on offer at Essence of Nature, Uttarakhand. Essence of Nature is one of India's finest examples of sustainable architecture. Every bit of this project is carefully conceived to help nature cleanse your system of all its impurities. Be it the air you breathe, the food you consume, the water you drink, or the views you see - be cocooned in purity. To make the experience that much more unforgettable, state-of-the-world luxurious amenities have been incorporated in the project. Sustainable architecture is the genre of architecture that utilises environmentally conscious design techniques. In the broad context, sustainable architecture seeks to minimize the negative environmental impact of buildings by enhancing efficiency and moderation in the use of materials, energy, and development space.